CEO CookOff : Today's the big day! 30 of the greatest chefs on the planet! 60 world changing, heart-meltingly awesome CEOs! 7 local, zero-waste food producers rocking the food industry into a better future! Fruit Magpie – Hazel, the queen of fruit cheese, churns out world-class membrillo de dulce from Tottenham! Kupros Dairy – Anthony turns locally sourced raw ewe’s milk into addictively butter British cheese, including Angloumi, London Fettle and WheyCurd! Local Honey Man – Curtis, the urban ‘beentreprenuer’ coaxes liquid gold from his team of bees to produce 100% pure, raw and natural local honey – straight from the hive to the jar! Toast Ale – Tristram and his team of food waste advocates at @feedbackorg’s genius solution to the tonnes of bread that go to waste – make GREAT BRITISH BEER! And, even better, all profits support the fight against food waste! Growing Underground – Rich and Steven of Zero Carbon Food’s brilliant micro green, pesticide-free brainchild, thriving 33 metres below the busy streets of Clapham. Food Assembly – A Europe-wide network of communities buying fresh food directly from local producers and farmers. Farmers and foodmakers get over 80% for every product sold, compared to the 15%-25% that most supermarkets offer them. And £471,787 raised so far for two initiatives pushing peoples’ health to the top of the UK’s agenda. Tonight, the UK’s top business leaders will team up with the nation’s best chefs to cook a banquet for hundreds of everyday heroes who work tirelessly to help others. The event will take place tonight in Old Billingsgate Market on the north bank of London’s winding river Thames. Her Royal Highness The Duchess of Cornwall will attend the UK CEO CookOff as Patron of UKHarvest. UKHarvest learned first hand how tonnes of good food was going to waste from their years of work in Australia. They learned how it could be better used by social service organizations trying to provide nutritious food to people without – if only those organizations had easier access to it from a source they could trust. And so the concept was born in 2004 – OzHarvest launched as the first perishable food rescue organization in Australia, redistributing good surplus food from more than 2,000 commercial outlets and delivering it direct and free of charge to more than 900 charities. It’s newly minted sister across the pond, UKHarvest, is now working to do the same in the UK. Jamie Oliver will there too! Jamie and his Food Foundation have teamed up with UKHarvest because food waste is an important part of a bigger conversation that needs to happen globally about food. It’s the only way the food system will become a source of better health for people and the planet – instead of harm. The CEO CookOff is a great example of what can be achieved when we all come together to keep that conversation alive – and turn it into action. The money we’re raising together will do just that. It will fund vital food education programmes that the Jamie Oliver Food Foundation and Jamie’s Ministry of Food run and the advocacy initiatives that keep them alive and well. And UKHarvest’s food waste reduction initiatives. 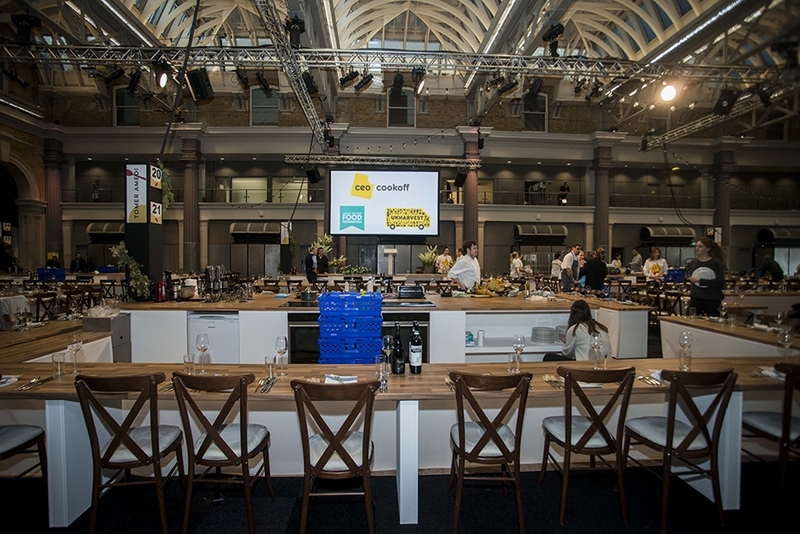 Catch all of the action on @FoodRev and @UKHarvest as CEO Cook-Off kicks-off! We'd also LOVE your help! Please donate today and help raise vital funds for to make sure our work helping families learn to cook and preventing food waste across the UK can continue.